If you have a damaged tooth, don’t put off a dental visit until you can’t take the irritation any longer. Waiting until the pain kicks in means a problem that was once a minor bother is now a major issue that will likely require an invasive restoration. As it turns out, plenty of damaged teeth can be quickly and easily corrected with tooth bonding performed by Midtown Manhattan dentist Dr. Michael J. Wei, saving you from oral health problems in the future. Fast and painless, tooth bonding is the effective, non-invasive – and affordable – way to repair a damaged tooth. Porcelain crowns aren’t the only way to fix chipped, jagged, or discolored teeth. In many situations, tooth bonding can even take the place of a crown, whitening your tooth or teeth until they blend in with your natural teeth. Tooth bonding can usually be completed in just one visit to your Midtown Manhattan dentist and takes 30 minutes to one hour per tooth to complete. Prep time: Tooth bonding requires minimal prep, usually just a light sanding of the enamel before the tooth is covered with a conditioning liquid. Application: The application of the tooth-colored resin is painless. The resin is brushed on to create a robust new tooth structure. 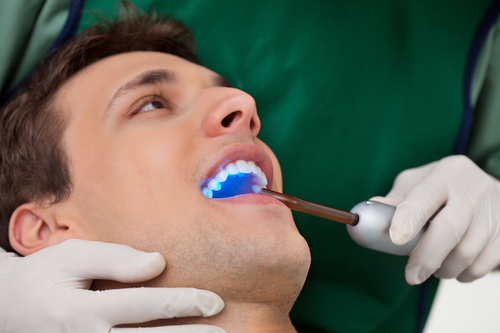 Bonding: The resin is cured with a special light so that it hardens and bonds to your tooth. Shaping: The tooth is meticulously sculpted into its original natural shape so that it looks just like your neighboring teeth in size and color. Polishing: The final step in the tooth bonding process is to polish the newly restored tooth until it gleams. Unlike teeth that receive porcelain veneers, teeth that undergo dental bonding are covered with a sensitive resin that is susceptible to staining. Your Midtown Manhattan dentist will advise you to avoid any acidic foods or those that typically stain – wine, coffee, dark sauces – for a day or two after the bonding is complete. After that, daily brushing and flossing and dental cleanings and exams every six months will enable your bonding to last for a decade or more. Any damaged, unsightly, or problem teeth make it much harder to eat and make you less likely to smile wide and speak up for fear of others seeing your dental issue. Anyone who undergoes tooth bonding quickly realizes that not only is the appearance of their tooth restored, its function is too. Besides being used to repair a jagged or broken tooth, bonding can also be applied to teeth that have surface cracks and are misshapen, gapped, or decayed. In some cases, bonding can help protect teeth that are experiencing gum recession. In all restorative dentistry cases, your New York City dentist will review all potential restoration options with you so, together, you can determine the best option for the repair. You can change your look. You can have an amazing smile. Not all smile makeovers are drawn-out or costly. Learn more about tooth bonding and whether it is a viable option for your dental repair. Schedule your consultation with Dr. Michael J. Wei in Midtown Manhattan to discuss your oral health and find out whether tooth bonding will work for you.